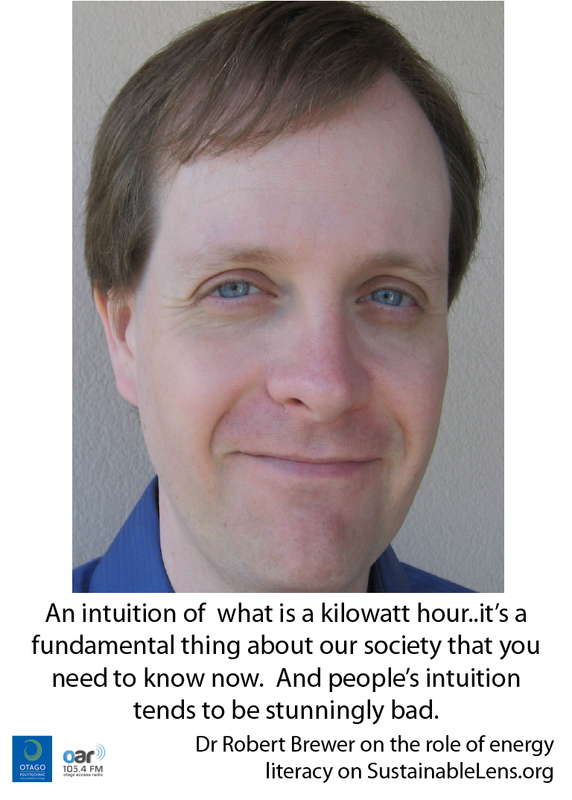 An intuition of what is a kilowatt hour..it’s a fundamental thing about our society that you need to know now. And people’s intuition tends to be stunningly bad. Dr Robert Brewer is a postdoctoral researcher on the EcoSense and Virtual Power Plant for Smart Grid Ready Buildings and Customers(VPP4) projects in theComputer Science department of Aarhus University in Denmark, with a focus on residential energy-use behaviors guided by sensor data. For several years Robert was an entrepreneur in Hawaii then for his PhD he developed the Kukui Cup, a gamified energy challenge for university dorms. An Inconvenient Truth was a turning point for me, I’d always considered myself green – tried to recycle and so forth – but An Inconvenient Truth made me feel ‘this is what I should focus my life on’, my research, why should I do my research on something else when I can do my research on something I feel passionately about. It is common that people have the attitudes and knowledge about the importance of sustainability but that societal structures are such that it is very hard sometimes to put these into effect. Sometimes people want to express energy as – say number of hamburgers or miles driven and , but … understanding what a kilowatt hour is, or having an intuition of what is a kilowatt hour…. is the same as you should really have an intuition of what kilometer is, or a kilogram. It’s a fundamental thing about our society that you need to know now. And people’s intuition tends to be stunningly bad. People focus on things like their phones as ‘energy hogs’ and are concerned about charging their cellular phone, but the refrigerator uses vastly more energy than their phone does, even including the infrastructure, because the refrigerator is on 24/7 for the rest of your life. I looked at energy literacy and energy use. When people ask us how much electricity we (the challenge saved), we say that’s the wrong question, we hoped that there would be significant energy savings, we didn’t see that but the fact that there was so much variation shows us that trying to compress the entire behaviour of these floors into a number – into kilowatt hours – is just a bad idea. That’s driven my change in perspective to this practice orientation, you need to understand whats going on in the dorms in a way that we didn’t have the opportunity to find out. Some game action was clearly not sustainable – camping out rather than using the measured dorms. Other game techniques had social benefits such as more time visiting other floors. A better measure of success is engagement and energy literacy. A key is not just to reduce energy use but to shift its time of use – to reduce large peaks. We need shifts in sustainable computing that are scaleable, sticky and multidisciplinary. Scalability: Since the scale of sustainability is a multi-generational issue, that’s going to take really big changes…to get the scale we need to have tools and services that scale. Sticky: We need to have ways that keep people engaged. There are lots things that look and sound really cool when you first see them…but people use it a lot when they first got it, but then the device makes mistakes and the people think its working and the novelty has worn off. If it’s primarily novelty that’s keeping you involved, you’ll find out that the novelty wears off. You need a reason to come back. We’re mixing the practice orientation with a rich set of sensors into what we hope is a virtuous cycle. Take a look at the resources you are using…it goes back to building the intuition of what you are using.